Plants are multicellular, mostly photosynthetic eukaryotes that also have cell walls composed of cellulose, do not have a central nervous system, are generally non-motile, and reproduce sexually, often by alternation of phases of a single generation (Alternation of generations). This kingdom includes familiar organisms such as trees, shrubs, herbs, and ferns. Over 350,000 species of plants have been estimated to exist. As of 2004, some 287,655 species had been identified, of which 258,650 are flowering plants. In addition to plants' central ecological role—photosynthesis and carbon fixation by plants is the ultimate source of energy and organic material for nearly all ecosystems, and plants are primary producers of atmospheric oxygen—plants provide to humans vital nutritional and economic values. Indeed, the human diet is centered on plants, whether directly via grains, fruits, vegetables, legumes, and so forth, or indirectly via animals that consume or pollinate plants. Plants also provide valuable products, such as lumber, paper, and medicines. Beyond these external values, plants also touch upon the inner nature of people by providing aesthetic value and joy, such as their use in landscaping, decoration, and works of art, as well as via the smells and sights of flowers and the rich tastes of fruits. Aristotle divided all living things between plants, which generally do not move or have sensory organs, and animals exhibiting sensory movement and motility. In Carolus Linnaeus' system, these became the Kingdoms Vegetabilia (later Plantae) and Animalia. Since then, it has become clear that the Plantae as originally defined included several unrelated groups, and the fungi and several groups of algae were removed to new kingdoms. However, these are still often considered plants in many contexts. Indeed, any attempt to match "plant" with a single taxon is doomed to fail, because plant is a vaguely defined concept unrelated to the presumed phylogenic concepts on which modern taxonomy is based. The most familiar plants are the multicellular land plants with specialized reproductive organs, called embryophytes. They include the vascular plants—plants with full systems of leaves, stems, and roots. They also include a few of their close relatives, often called bryophytes, of which mosses and liverworts are the most common. All of these plants comprise eukaryotic cells with cell walls composed of cellulose, and most obtain the energy through photosynthesis, using light and carbon dioxide to synthesize food. Plants are distinguished from green algae, from which they are considered to have evolved, by having specialized reproductive organs protected by non-reproductive tissues. Many plants are epiphytes, meaning they grow on other plants, usually trees, without parasitizing them. Epiphytes may indirectly harm their host plant by intercepting mineral nutrients and light that the host would otherwise receive. The weight of large numbers of epiphytes may break tree limbs. Many orchids, bromeliads, ferns and mosses often grow as epiphytes. Bromeliad epiphytes accumulate water in leaf axils to form phytotelmata, complex aquatic food webs. A few plants are carnivorous, such as the Venus Flytrap and sundew. They trap small animals and digest them to obtain mineral nutrients, especially nitrogen. Vascular plants comprise those embryophytic plants that have specialized tissues for conducting water. Vascular plants include the seed plants—flowering plants (angiosperms), and gymnosperms—as well as non-seed (vascular) plants, such as ferns, clubmosses, and horsetails. Water transport happens in either xylem or phloem: the xylem carries water and inorganic solutes upward toward the leaves from the roots, while phloem carries organic solutes throughout the plant. Seed-bearing plants were traditionally divided into angiosperms, or flowering plants, and gymnosperms, which includes the gnetae, cycads, ginkgo, and conifers. Angiosperms are now thought to have evolved from a gymnosperm ancestor, which would make gymnosperms a paraphyletic group if it includes extinct taxa. Modern cladistics attempts to define taxa that are monophyletic, traceable to a common ancestor and inclusive therefore of all descendants of that common ancestor. Although not a monophyletic taxonomic unit, "gymnosperm" is still widely used to distinguish the four taxa of non-flowering, seed-bearing plants from the angiosperms. Molecular phylogenies have conflicted with morphologically-based evidence as to whether extant gymnosperms comprise a monophyletic group. 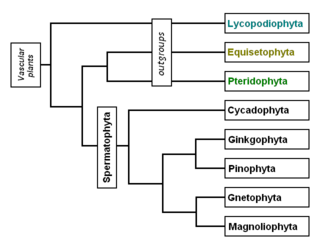 Some morphological data suggests that the Gnetophytes are the sister-group to angiosperms, but molecular phylogenies have generally shown a monophyletic gymnosperm clade that includes the Gnetophytes as sister-group to the conifers. The fossil record contains evidence of many extinct taxa of seed plants. The so-called "seed ferns" (Pteridospermae) were one of the earliest successful groups of land plants, and forests dominated by seed ferns were prevalent in the late Paleozoic (359 - 253 mya). Glossopteris was the most prominent tree genus in the ancient southern supercontinent of Gondwana during the Permian period (299 - 253 mya). By the Triassic period (253 - 201 mya), seed ferns had declined in ecological importance, and representatives of modern gymnosperm groups were abundant and dominant through the end of the Cretaceous, when angiosperms radiated. Adderstongues (Ophioglossophyta, but have also been grouped with the true ferns in Pteridophyta). Psilotophyta, or Psilotales (the "whisk ferns") is a grouping of nonseed plants that sometimes is considered as an order of the Class Ophioglossopsida. This order contains only two living genera, Psilotum, a small shrubby plant of the dry tropics, and Tmesipteris, anepiphyte found in Australia, New Zealand, and New Caledonia. There has long been controversy about the relationships of the Psilotophyta, with some claiming that they are ferns (Pteridophyta), and others maintaining that they are descendants of the first vascular plants (the Psilophyta of the Devonian period). Recent evidence from DNA demonstrates a much closer relationship to the ferns, and that they are closely related to the Ophioglossales, in particular. Psilotales lack leaves, instead having small outgrowths called enations. The enations are not considered true leaves because there is only a vascular bundle just underneath them, but not inside, as in leaves. Psilotales also do not have true roots. They are anchored by rhizoids. Absorption is aided by symbiotic fungi called mycorrhizae. Three sporangia are united into a synangium, which is considered to be a very reduced series of branches. There is a thick tapetum to nourish the developing spores, as is typical of eusporangiate plants. The gametophyte looks like a small piece of subterranean stem, but produces antheridia and archegonia. The Ophioglossophyta (lit. 'snake-tongue-leaved') are a small group of plants, the adders'-tongues and the moonworts and grape-ferns. Traditionally, they are included in the division Pteridophyta, the ferns, originally as a family and later as the order Ophioglossales. 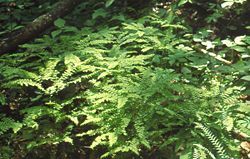 However, it is now recognized that this group is wholly distinct from the ferns and apparently from the other extant groups of plants. Thus they may be given a separate division, called the Ophioglossophyta. One scheme groups them with the horsetails and whisk ferns in the division Archeophyta. The two principal families of ophioglossoids are the adders'-tongues, Ophioglossaceae, and the moonworts and grape-ferns, Botrychiaceae. Many workers still place the moonworts in the Ophioglossaceae, along with the distinct species Helminthostachys zeylanica. Other times, this species is given its own family Helminthostachiaceae. All the ophioglossoids have short-lived spores formed in sporangia lacking an annulus, and borne on a stalk that splits from the leaf blade; and fleshy roots. 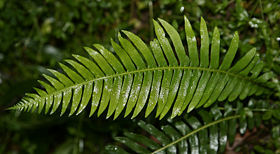 Many species only send up one frond or leaf-blade per year. A few species send up the fertile spikes only, without any conventional leaf-blade. The gametophytes are subterranean. The spores will not germinate if exposed to sunlight, and the gametophyte can live some two decades without forming a sporophyte. The genus Ophioglossum has the highest chromosome counts of any known plant. The Division Lycopodiophyta (sometimes called Lycophyta), comprising the clubmosses, spikemosses, and quillworts, is the oldest extant (living) vascular plant division and includes some of the most "primitive" extant species. These species reproduce by shedding spores and have macroscopic alternation of generations, although some are homosporous while others are heterosporous. They differ from all other vascular plants in having "microphylls," leaves that have only a single vascular trace (vein) rather than the much more complex megaphylls found in ferns and seed plants. The members of this division have a long evolutionary history, and fossils are abundant worldwide, especially in coal deposits. In fact, most known genera are extinct. The Silurian (444 - 417 mya) species Baragwanathia longifolia represents the earliest identifiable Lycopodiophyta, while some Cooksonia seem to be related. The Lycopodiophyta are one of several classes of plants that expanded onto land during the Silurian and Devonian periods. They developed specialized roots to extract nutrients from the soil and developed leaves for photosynthesis and gas exchange, using a stem for transport. A waxy cuticle helped retain moisture, and stoma allowed respiration. The vulnerable meiotic gametophyte is protected from radiation by its reduced size and often by the use of subterranean mycorrhiza for its energy source instead of photosynthesis. Club-mosses are homosporous, but spike-mosses and quillworts are heterosporous. In heterospores, the female spores are larger than the male because they store food for the new generation. The horsetails comprise 15 species of plants in the genus Equisetum. This genus is the only one in the family Equisetaceae, which in turn is the only family in the order Equisetales and the class Equisetopsida. This class is often placed as the sole member of the Division Equisetophyta (also called Arthrophyta in older works), though some recent molecular analyses place the genus within Pteridophyta, related to Marattiales. Other classes and orders of Equisetophyta are known from the fossil record, where they were important members of the world flora during the Carboniferous (359 - 299 mya) period. The name "horsetail" arose because it was thought that the stalk resembled a horse's tail; the name Equisetum is from the Latin equus, "horse," and seta, "bristle." Other names, rarely used, include candock (applied to branching species only), and scouring-rush (applied to the unbranched or sparsely branched species). The name scouring-rush refers to its rush-like appearance and because the stems are coated with abrasive silica that led them to be used for scouring cooking pots in the past. The genus is near-cosmopolitan, being absent only from Australasia and Antarctica. They are perennial plants, either herbaceous, dying back in winter (most temperate species) or evergreen (some tropical species, and the temperate Equisetum hyemale). They mostly grow 0.2-1.5 m (0.6 - 4.9 ft) tall, though E. telmateia can exceptionally reach 2.5 m (8.2 ft), and the tropical American species E. giganteum 5 m (16.4 ft), and E. myriochaetum 8 m (53.7 ft). In these plants, the leaves are greatly reduced, being represented only by whorls of small, translucent scales. The stems are green and photosynthetic, also distinctive in being hollow, jointed, and ridged (with 6 - 40 ridges). There may or may not be whorls of branches at the nodes; when present, these branches are identical to the main stem except smaller. The spores are borne in cone-like structures (strobilus, pl. strobili) at the tips of some of the stems. In many species they are unbranched, and in some (e.g., E. arvense) they are non-photosynthetic, produced early in spring separately from photosynthetic sterile stems. In some other species (e.g., E. palustre), they are very similar to sterile stems, photosynthetic, and with whorls of branches. Horsetails are mostly homosporous, though in E. arvense, smaller spores give rise to male prothalli. The spores have four elaters that act as moisture-sensitive springs, ejecting the spores through a weak spot of the sporangia. The horsetails were a much larger and more diverse group in the distant past before seed plants became dominant across the Earth. Some species were large trees reaching to 30 m (99.4 ft) tall. The genus Calamites (Family Calamitaceae) is abundant in coal deposits from the Carboniferous period. Non-vascular plants include those land plants (embryophytes) without a vascular system. Bryophytes—the Bryophyta (mosses), the Hepaticophyta (liverworts), and the Anthocerotophyta (hornworts)—are the only nonvascular plants grouped within the Kingdom Plantae. In these groups, the primary plants are haploid, with the only diploid portion being the attached sporophyte, consisting of a stalk and sporangium. Because these plants lack water-conducting tissues, they fail to achieve the structural complexity and size of most vascular plants. Some algae are also nonvascular, but these are no longer grouped in the plant kingdom. Recent studies have demonstrated that the algae actually consist of several unrelated groups. It turns out that common features of living in water and photosynthesis were misleading as indicators of close relationship. The algae comprise several different groups of organisms that produce energy through photosynthesis. However, they are not classified within the Kingdom Plantae, but mostly in the Kingdom Protista. Most conspicuous are the seaweeds, multicellular algae that may roughly resemble terrestrial plants, but are classified among the green, red, and brown algae. These and other algal groups also include various single-celled organisms. Only the green algae are still considered relatives of the plants, although these also are generally classified as protists rather than as plants. The embryophytes developed from green algae; the two groups are sometimes collectively referred to as the green plants or Viridiplantae. The Kingdom Plantae is at times taken to mean this monophyletic grouping. With a few exceptions among the green algae, all such forms have cell walls containing cellulose and chloroplasts containing chlorophylls a and b, and store food in the form of starch. They undergo closed mitosis without centrioles (barrel-shaped microtubules that aids in the cell division process), and typically have mitochondria with flat cristae. The chloroplasts of green plants are surrounded by two membranes, suggesting they originated directly from endosymbiotic cyanobacteria. The same is true of the red algae, and the two groups are generally believed to have a common origin. In contrast, most other algae have chloroplasts with three or four membranes. They are not close relatives of the green plants, presumably in origin acquiring chloroplasts separately from ingested or symbiotic green and red algae. Unlike embryophytes and algae, fungi are not photosynthetic, but are saprophytic, obtaining food by breaking down and absorbing surrounding materials. Most fungi are formed by microscopic structures called hyphae, which may or may not be divided into cells but contain eukaryotic nuclei. Fruiting bodies, of which mushrooms are most familiar, are the reproductive structures of fungi. They are not related to any of the photosynthetic groups, but are close relatives of animals. Therefore, the fungi are in a kingdom of their own. Bryophytes first appeared during the early Palaeozoic (~450 million years ago). They can only survive where moisture is available for significant periods, although some species are desiccation tolerant. Most species of bryophytes remain small throughout their life cycle. This involves an alternation between two generations: a haploid stage, called the gametophyte, and a diploid stage, called the sporophyte. The sporophyte is short-lived and remains dependent on its parent gametophyte. Vascular plants first appeared during the Silurian (444 - 417 mya) period, and by the Devonian (417 - 359 mya) had diversified and spread into many different land environments. They have a number of adaptations that allowed them to overcome the limitations of the bryophytes. These include a cuticle resistant to desiccation, and vascular tissues which transport water throughout the organism. In most, the sporophyte acts as a separate individual, while the gametophyte remains small. The first primitive seed plants, Pteridosperms (seed ferns) and Cordaites, both groups now extinct, appeared in the late Devonian and diversified through the Carboniferous, with further evolution through the Permian and Triassic periods. In these the gametophyte stage is completely reduced, and the sporophyte begins life inside an enclosure called a seed, which develops while on the parent plant, and with fertilization by means of pollen grains. Whereas other vascular plants, such as ferns, reproduce by means of spores and so need moisture to develop, some seed plants can survive and reproduce in extremely arid conditions. Early seed plants are referred to as gymnosperms (naked seeds), as the seed embryo is not enclosed in a protective structure at pollination, with the pollen landing directly on the embryo. Four surviving groups remain widespread now, particularly the conifers, which are dominant trees in several biomes. The angiosperms, comprising the flowering plants, were the last major group of plants to appear, emerging from within the gymnosperms during the Jurassic (201-147 mya) and diversifying rapidly during the Cretaceous (147-66 mya). These differ in that the seed embryo is enclosed, so the pollen has to grow a tube to penetrate the protective seed coat; they are the predominant group of flora in most biomes today. Plant fossils include roots, wood, leaves, seeds, fruit, pollen, spores, phytoliths, and amber (the fossilized resin produced by some plants). Fossil land plants are recorded in terrestrial, lacustrine, fluvial, and nearshore marine sediments. Pollen, spores and algae (dinoflagellates and acritarchs) are used for dating sedimentary rock sequences. The remains of fossil plants are not as common as fossil animals, although plant fossils are locally abundant in many regions worldwide. Early fossils of these ancient plants show the individual cells within the plant tissue. The Devonian period also saw the evolution of what many believe to be the first known modern tree, Archaeopteris. This fern-like tree combined a woody trunk with the fronds of a fern, but produced no seeds. The Coal Measures are a major source of Palaeozoic plant fossils, with many groups of plants in existence at this time. The spoil heaps of coal mines are the best places to collect; coal itself is the remains of fossilized plants, though structural detail of the plant fossils is rarely visible in coal. In the Fossil Forest at Victoria Park in Glasgow, Scotland, the stumps of Lepidodendron trees are found in their original growth positions. The fossilized remains of conifer and angiosperm roots, stems, and branches may be locally abundant in lake and inshore sedimentary rocks from the Mesozoic and Cenozoic eras. Sequoia and its allies, magnolia, oak, and palms are often found. See articles on life cycle, gymnosperm, angiosperm, bryophyte, and fern for more complete discussion of plant reproduction. In flowering plants, male sexual parts, the stamen, produce gametes called pollen grains, which attach to a a female receiving part, the pistil, in which the female gametes (ovules) are located. Here, the female gamete is fertilized and develops into a seed. The ovary, which produced the gamete then grows into a fruit surrounding the seed(s). Plants may either self-pollinate or cross-pollinate. Sporic or diplohaplontic life cycle. A diploid (2n) sporophyte undergoes meiosis to produce haploid (1n) reproductive cells, often called spores. 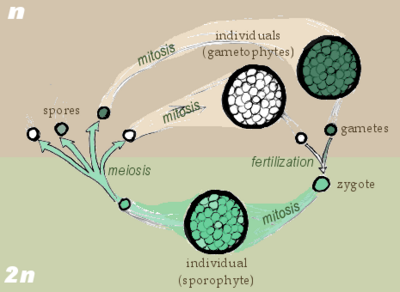 Haploid cells undergo mitosis to produce a gametophyte. The gametophyte produces haploid gametes which fuse to form a diploid zygotic sporophyte. Alternation of generations is a reproductive cycle of those plants, fungi and protists in which a sexual reproductive phase alternates with an asexual reproductive phase. The term can be confusing for people familiar only with the life cycle of a typical animal. A more understandable name would be "alternation of phases of a single generation" because we usually consider a generation of a species to encompass one complete life cycle. The life cycle of organisms with "alternation of generations" is characterized by each phase consisting of one of two distinct organisms: a gametophyte (thallus (tissue) or plant), which is genetically haploid, and a sporophyte (thallus or plant), which is genetically diploid. A haploid plant of the gametophyte generation produces gametes by mitosis. Two gametes (originating from different organisms of the same species or from the same organism) combine to produce a zygote, which develops into a diploid plant of the sporophyte generation. This sporophyte produces spores by meiosis, which germinate and develop into a gametophyte of the next generation. This cycle, from gametophyte to gametophyte, is the way in which all land plants and many algae undergo sexual reproduction. The pattern generally applies to the flowering plants even though the application is not apparent because the gametophyte, haploid generation is vastly reduced in size. The pollen grain itself is the male gametophyte and the plant's embryo sac within the ovule is the female gametophyte. The diploid plant itself is the sporophyte generation. Vegetative reproduction is a type of asexual reproduction found in plants, and is also called vegetative propagation or vegetative multiplication. It is a process by which new plant "individuals" arise or are obtained without production of seeds or spores. It is both a natural process in many plant species (including organisms outside of the plant kingdom, such as bacteria and fungi) and one utilized or encouraged by horticulturists to obtain quantities of economically valuable plants. Natural vegetative reproduction is mostly a process found in herbaceous and woody perennials, and typically involves structural modifications of the stem, although any horizontal, underground part of a plant (whether stem or a root) can contribute to vegetative reproduction of a plant. And, in a few species (such as Kalanchoë shown at right), leaves are involved in vegetative reproduction. Most plant species that survive and significantly expand by vegetative reproduction would be perennial almost by definition, since specialized organs of vegetative reproduction, like seeds of annuals, serve to survive seasonally harsh conditions. A plant that persists in a location through vegetative reproduction of individuals over a long period of time constitutes a clonal colony. In a sense, this process is not one of "reproduction" but one of survival and expansion of biomass of the individual. When an individual organism increases in size via cell multiplication and remains intact, the process is called "vegetative growth." However, in vegetative reproduction, the new plants that result are new individuals in almost every respect except genetic. And of considerable interest is how this process appears to reset the aging clock. A rhizome is a modified stem serving as an organ of vegetative reproduction. Prostrate aerial stems, called runners or stolons are important vegetative reproduction organs in some species, such as the strawberry, numerous grasses, and some ferns. Adventitious buds develop into above ground stems and leaves, forming on roots near the ground surface and on damaged stems (as on the stumps of cut trees). Adventitious roots form on stems where the latter touch the soil surface. A form of budding called suckering is the reproduction or regeneration of a plant by shoots that arise from an existing root system. Species that characteristically produce suckers include Elm (Ulmus), Dandelion (Taraxacum), and members of the Rose Family (Rosa). Another type of vegetative reproduction is the production of bulbs. Plants like onion (Allium cepa), hyacinth (Hyacinth), narcissus (Narcissus) and tulips (Tulipa) reproduce by forming bulbs. Other plants like potatoes (Solanum tuberosum) and dahlia (Dahlia) reproduce by a similar method of producing tubers. Gladioluses and crocuses (Crocus) reproduce by forming a bulb-like structure called a corm. Vegetative propagation is usually considered a cloning method. However, there are several cases in which vegetatively propagated plants are not genetically identical. 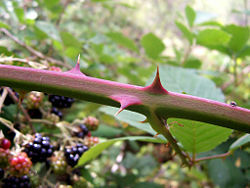 Rooted stem cuttings of thornless blackberries will revert to thorny type because the adventitious shoot develops from a cell that is genetically thorny. Thornless blackberry is a chimera, with the epidermal layers genetically thornless but the tissue beneath it genetically thorny. Leaf cutting propagation of certain chimeral variegated plants, such as snake plant, will produce mainly nonvariegated plants. It is a common misconception that most of the solid material in a plant is taken from the soil, when in fact almost all of it is actually taken from the atmosphere. Through a process known as photosynthesis, plants use the energy in sunlight to convert carbon dioxide from the atmosphere into simple sugars. These sugars are then used as building blocks and form the main structural component of the plant. Plants rely on soil primarily for water (in quantitative terms), but also obtain nitrogen, phosphorus and other crucial elemental nutrients. Annual: live and reproduce within one growing season. Biennial: live for two growing seasons; usually reproduce in second year. Perennial: live for many growing seasons; continue to reproduce once mature. Among the vascular plants, perennials include both evergreens that keep their leaves the entire year, and deciduous plants which lose their leaves for some part. In temperate and boreal climates, deciduous plants generally lose their leaves during the winter; many tropical deciduous plants lose their leaves during the dry season. The growth rate of plants is extremely variable. Some mosses grow less than 0.001 mm/h, while most trees grow 0.025-0.250 mm/h. Some climbing species, such as kudzu, which do not need to produce thick supportive tissue, may grow up to 12.5 mm/h (0.5 in/h). The photosynthesis and carbon fixation conducted by land plants and algae are the ultimate source of energy and organic material in nearly all ecosystems. These processes radically changed the composition of the early Earth's atmosphere, which as a result is now approximately 20 percent oxygen. Animals and most other organisms are aerobic, relying on oxygen; those that do not are confined to relatively rare anaerobic, oxygen-depleted, environments. Much of human nutrition depends on plants, whether directly or indirectly via animals that consume or pollinate plants. Much of the human diet comes in the form of cereals. Other plants or plant parts that are eaten include fruits, vegetables, legumes, herbs, and spices. Strict vegetarians rely entirely on plants (as well as some algae and fungi) for their nutrition. Many plants provide important medicines. Some vascular plants, referred to as trees and shrubs, produce woody stems and are an important source of building material or raw material for producing paper. Beyond these ecological, nutritional, and economic values, plants also touch upon the human inner nature through the aspect of beauty. Trees and flowering plants are used in landscaping and decoration, and are featured in works of art. The smells and sights of flowers have a valuable impact on the human mood, and the tastes of fruits bring enjoyment to people. Bowe, L. M., G. Coat, and C. W. dePamphilis. 2000. Phylogeny of seed plants based on all three genomic compartments: Extant gymnosperms are monophyletic and Gnetales' closest relatives are conifers. Proceedings of the National Academy of Sciences 97: 4092-4097. Chaw, S., C. L. Parkinson, Y. Cheng, T. M. Vincent, and J. D. Palmer. 2000. Seed plant phylogeny inferred from all three plant genomes: Monophyly of extant gymnosperms and origin of Gnetales from conifers. Proceedings of the National Academy of Sciences 97: 4086-4091 (abstract here). Evans, L. T. 1998. Feeding the Ten Billion: Plants and Population Growth. Cambridge University Press. ISBN. 0521646855.
International Union for Conservation of Nature and Natural Resources (IUCN) Species Survival Commission. 2004. IUCN Red List of Threatened Species. .
Kenrick, P., and P. R. Crane. 1997. The Origin and Early Diversification of Land Plants: A Cladistic Study. Washington, DC: Smithsonian Institution Press. ISBN 1560987308. Prance, G. T. 2001. Discovering the Plant World. Taxon 50: 345-359. Raven, P. H., R. F. Evert, and S. E. Eichhorn. 2005. Biology of Plants, 7th ed. New York: W. H. Freeman and Company. ISBN 0716710072. Soltis, D. E., P. S. Soltis, and M. J. Zanis. 2002. Phylogeny of seed plants based on evidence from eight genes. American Journal of Botany 89: 1670-1681 (abstract here). Taylor, T. N., and E. L. Taylor. 1993. The Biology and Evolution of Fossil Plants. Englewood Cliffs, NJ: Prentice Hall. ISBN 013651589. This page was last modified on 6 May 2015, at 19:19.